Sales tracking is as essential for any organization as a scoreboard is for a ball game. To be effective players must see it 24-7. Keep your sales people motivated with these magnetic sales tracking whiteboards. Post their successes and show your team how each win makes a difference. Everyone likes to see their successes displayed on these whiteboards for all to see. Place one in your office and watch your people turn more listeners into customers. 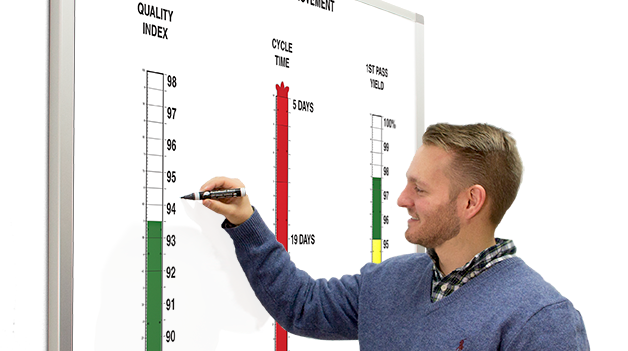 For over 47 years we have been designing and building completely flexible printed magnetic white board sales tracking and promotional visible board systems to plan, track, project, predict, measure, motivate and improve sales efforts. We offer here below, in ready to use kits, some of the sales tracking management board systems our customers tell us are the most successful in their operations. The include everything needed to operate them. If you would like one of our experienced design specialists to help you select the right whiteboard kit for your requirement, or would like to consider a custom-designed whiteboard, please Contact us or call us at 800 624 4154 (8-6, M-F, Eastern Time). No obligation. Our 53rdyear.